"Le Cordon Bleu takes the cake for a young fan"
Le Cordon Bleu completely won over one young fan at a recent open night. Eleven year-old Rivers Alexander has wanted to be a chef since the age of six and the event had all the ingredients to fuel his ambition. ‘I don’t usually like oysters, but because of the delicious garnish I actually ended up having two’, says Rivers. A lecture by two Le Cordon Bleu chefs followed, with guests treated to serves of oysters and champagne as part of the presentation. This is according to his father Alex Alexander who accompanied his son. 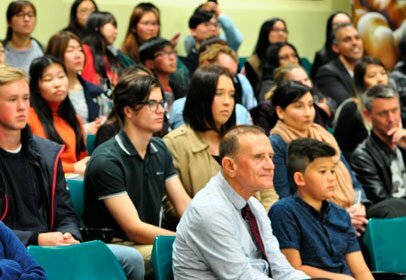 Held in the Le Cordon Bleu Adelaide lecture theatre to a packed house and a diverse audience of all ages and nationalities, the evening began with Le Cordon Bleu students greeting adult guests with champagne and everyone with oysters. ‘A delicious start to the evening’, says Alex Alexander. Within the first half hour I was left with the overwhelming impression that everything and everyone associated with Le Cordon Bleu is first class, not only from the standard of champagne served, which included expensive vintage brands, but also from the high quality of the lecturers. Brand Le Cordon Bleu was then given focus and two former students went on to speak about experiences at Le Cordon Bleu, which included work placements in five-star hotels, before going out into industry or starting up in business. ‘I came to realise that Le Cordon Bleu was a worldwide five-star brand of its own and that belonging to and studying with this organisation meant becoming part of a worldwide professional alumni that would ensure professional success in the food industry’, says Alex Alexander. Guests were then treated to a demonstration on how to prepare and cook the classic French dish, Cassoulet Toulousain, and then a desert of Lemon Diplomats, and they were then served both. ‘All the food was delicious, especially the Lemon Diplomats, and I really enjoyed the cassoulet’, says Rivers. The evening culminated with guests mingling with students and lecturers and a patisserie display. I left certain the Le Cordon Bleu is an elite tertiary institution, run with a passion for excellence. Any students who undergo this program are certain to be placed on a path of success, becoming part of a worldwide alumni of professionals with the opportunity to work anywhere in the world due to their training and contacts. ‘I hope my son attends and graduates from Le Cordon Bleu and realises his dream to become a chef in due course’, says Alex Alexander. Rivers went home happy with the night and even happier with a chef’s hat and apron given to him by ‘Chef Simon’... and a cake. Father and son thanked everyone at Le Cordon Bleu for the night. Based at the internationally renowned TAFE SA Regency International Centre for Hospitality, Leisure and Food Studies at Regency Park, Le Cordon Bleu Adelaide is the academic headquarters for Le Cordon Bleu in Australia. Other campuses are in Sydney, Melbourne and Perth. Another evening with Le Cordon Bleu will be held 26th October, 2016.